Art Farm Co-op is divided into three six week sessions with two week breaks in between. Fall session 1 just began on Saturday. These are some photos of the summer session. There are many more on the group Flickr. Links are provided at the end of this post. Each session is divided into four sections, each with a theme and a facilitator. The themes have just changed but I’m continuing forward with my creative projects. 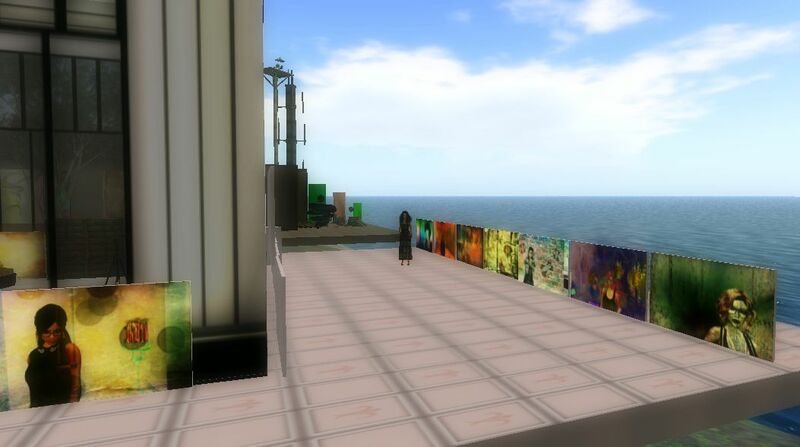 Just about any kind of performance or creativity in Second Life can fit nicely within the frameworks. Everyone is welcome to participate and visitors are very welcome as well. This grant for round nine has moved forward and expanded on the round eight LEA grant for Medici University. 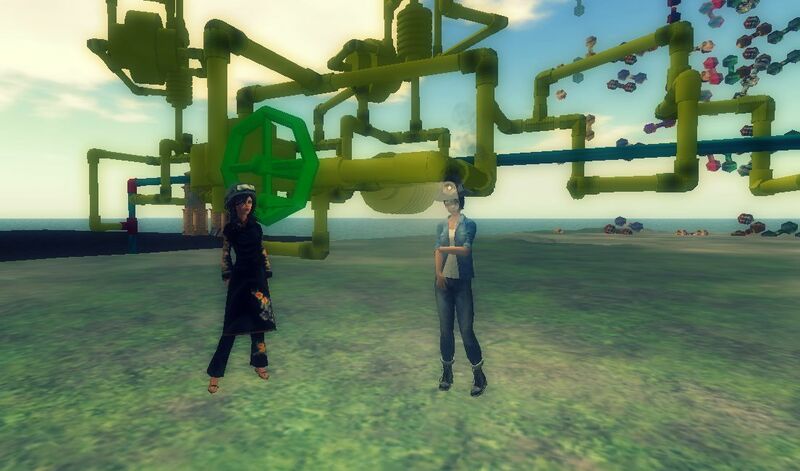 Some of the avatars who participated in that, like me, are here; some left and we’ve gained new learners. This is about sharing and community and so much more than plopping down a gallery, parking an afk avatar in it for one hour a week and much greater than a glorified sandbox. LEA has a wonderful art sandbox already. Avatars can take classes or teach a class. At Medici University I took Van Caerndow’s Drinking and Drawing class for four months. I met and became friends with Art Oluja at MU. I’ve recently blogged news about each of them. I’ve made awkward things in the 3D sculpture area and recieved encouragement. I’m learning to make machinima and have people responding positively to casting calls. The best way to participate here is to take an interest in what other people are doing, respond when they say hello and to show up for events. Well that’s just common sense in all lives. The photo above is by Kimika Ying. Like any farm, this place is never “complete and done”. Most of us call it ant farm and during the summer there was a fair amount of ant sculptures around. I just spotted an ant hill yesterday in the new pop up gallery area. One of the highlights of summer session was a guest seminar given by Gloriana Maertens of Guerilla Burlesque, shown in the photo above. She brought her own stage, gave a performance, blew up the stage to give a breakdown of the elements that go into dance performing in Second Life and pointed us in the direction of tools, leaving us with a wealth of resources. The event and resources are very well documented by the facilitator of Low-Fidelity, Newton Mr (lex.perdide). Gwynnie Beaumont had a glyph installation and Veyot led us on a field trip to The Egg where she filmed us in Eggs Over Easy. One of the things I most enjoyed was setting up a photography studio to make layered portraits of the other avatars participating. I ended up with 60 pieces and some great memories, all of people I met at Medici University and at summer session. They’ve all been uploaded to the Flickr group. Notice it’s called an art co-op, not a utopia. There are the usual communication breakdowns when humans and human-powered avatars get together. It’s highly recommended that anyone participating read the website info first and then ask questions of the leaders if something needs to be clarified. At the end of summer session we had parties, facilitated by Newton Mr, showing works in progress and performances, including what some of us are learning with the MetaHarper tools. It was a lovely finish to the six week session. Most of the communication is done in local or VB Friends group but some news can be found here at MU Talk. The official info on Art Farm Co-op Fall Session 1 at Edie’s Farm. 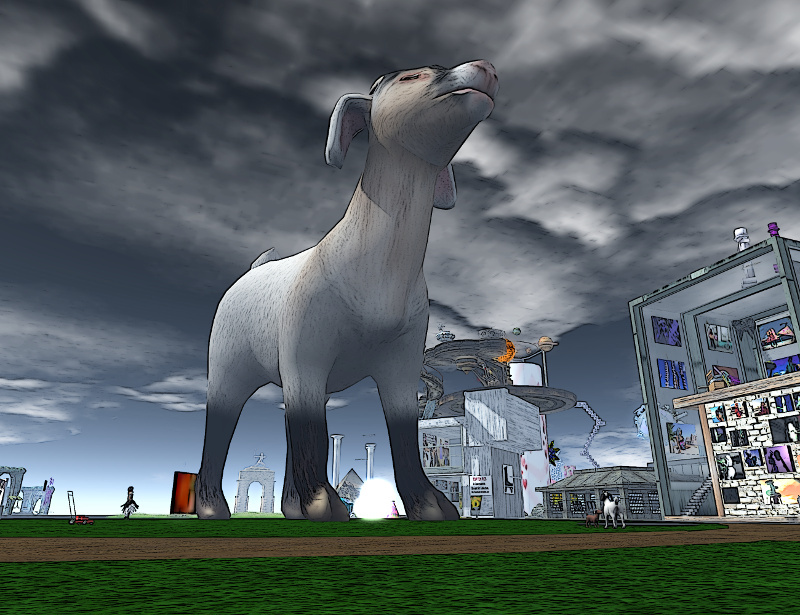 Gemma Cleanslate’s The Art Farm post for SL Newser. Thank you, very nice coverage of the moving target that is Art Farm!